Fall nights are in full swing and the harvest moon hangs low in the sky. There's no doubt about it, Halloween is just around the corner! Addressing landscaping issues like wet leaves, small dislodged branches and tangled roots can easily get put on the back burner for a busy property owner, but on Halloween these issues pose larger problems than simply lacking curb appeal. Any debris can threaten to cause injury to a young child or accompanying adult who may be coming up to your door. Lessen the risk of a slip or fall by maintaining your entryway and its surrounding areas. 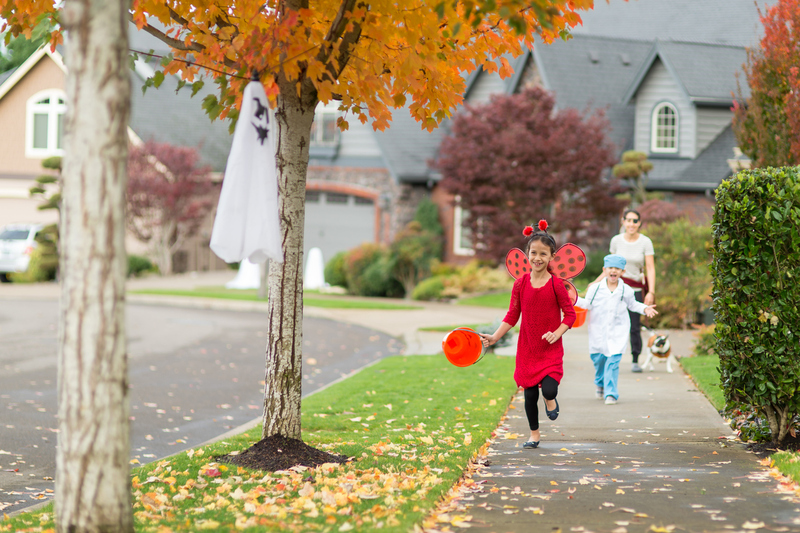 Remember, small children propelled by excessive amounts of sugar may find their way to your door by venturing across the lawn in search of candy. Address any potential hazards in your yard that could be problematic. For instance, fill any holes in your lawn to prevent injury, or mark them with a small flag to ward off twisted ankles or other injuries that could be sustained through haphazardly crossing that location. Dimly lit areas may seem spooky, but they can create real-life hazards and liabilities. If your entryway or the pathway to your door is dark, you may find trick-or-treaters unexpectedly injured due to poor visibility. Not only do you mitigate the risk of injuries when your property is well-lit at night, but criminal activity or simple teenage hijinks will likely be subdued when the culprits cannot count on being shrouded by darkness. It doesn't matter how well-behaved Fido may be on a good day; Halloween can create anxiety for any pet. Strange masks and costumes, a plethora of visiting "trespassers," additional noise and overstimulating decorations can spell trouble for a stressed-out dog who feels threatened. Prevent avoidable injuries and a traumatizing experience for your pet and prospective trick-or-treaters by simply keeping your animals away from the action. Remember, however, dog owners are not the only pet owners who should remain cautious this Halloween. Superstitious people can cause harm to animals they stumble across on Halloween night–this is a particular concern for cat owners. Overall, it's best to simply keep your animals inside on Halloween to ensure that everyone—including the furry members of your family—stays safe. Nothing says Halloween like spooky decorations. As enticing as it may be to go overboard, keep fire safety at the forefront of your mind. Candelabras, jack-o'-lanterns and other sources of open flames may set the mood, but can also set fire to your home if they're knocked over by a stray dinosaur tail or pirate sword. Opt instead for battery-operated lights—flameless lighting options (particularly the flickering ones) look just like a real candle, but keep your front door safe from open flames. Finally, remember to keep the exits and entrances to your home unobstructed. In October, what would have been a typical house fire can take a turn for the worse if your fire escape route has been impeded by a haunted horseman replica and a dozen fake spiderwebs. The perfect Halloween celebration involves dozens of smiles for neighborhood children. By implementing a few precautions before the spooky night arrives, you can ensure a safe and fun evening for everyone involved!